With a state of emergency still in place, Chatham-Kent officials stated on Sunday morning, February 10 that the Thames River water levels continue to drop slowly. According to Chatham-Kent officials on the scene, dikes have remained relatively stable with one repair currently in process. Municipal staff continue to monitoring several other areas. Water seepage continues to occur at the base of the dikes. Seepage should decline as the water level declines. Water channels are open at Lighthouse Cove but the ice jam remains stationary. The ice jam now extends from the mouth of the river to 250 meters west of the Prairie Siding Bridge. Drainage staff and contractors are on site monitoring the area and repairing dikes as required. Special thanks to the Lower Thames Valley Conservation Authority (LTVCA) for their support throughout the night. Emergency officials remain on standby. The public is being asked to avoid roads in the area since conditions could change quickly. The localized state of emergency enacted Friday will remain in place until the situation has fully stabilized. The municipality’s main phone number (519) 360-1998 is being staffed 24/7 for the remainder of the weekend. 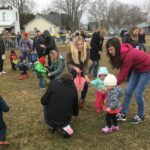 Chatham-Kent Mayor Darrin Canniff was at the scene Saturday and posted a video on his Facebook page. For updates from the LTVCA, click here.